WESTLAKE VILLAGE, CA, August 13, 2015 — Guitar Center Professional (GC Pro), the outside sales division of Guitar Center that focuses on the needs of professional users, is holding a series of seminars across the country focused on audio, video and lighting for house-of-worship facilities. 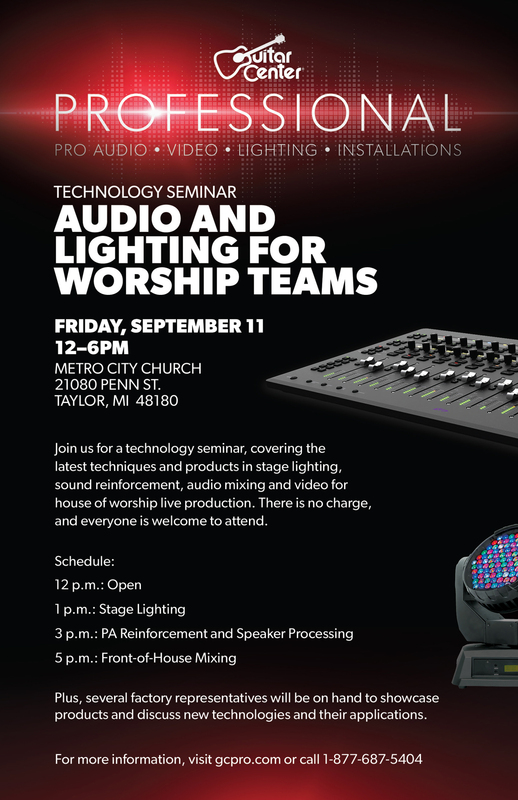 The event serving the Detroit area will take place in Taylor, Michigan, at Metro City Church (21080 Penn St.) on Friday, September 11, 2015, from 12 p.m. to 6 p.m.
Join us for a technology seminar, covering the latest techniques and products in stage lighting, sound reinforcement, audio mixing and video for house of worship live production. GC Pro personnel, including account manager Hawon Jung, will be on hand to lead the event and answer questions. Photo caption: Guitar Center Professional’s upcoming technology seminar in the Detroit area on September 11, 2015.